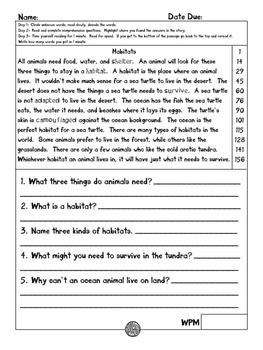 These are nonfiction reading passages about habitats. There is a first grade level passage, second grade level passage and a third grade level passage. 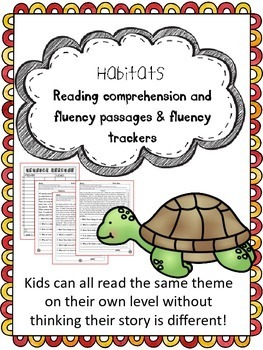 I've also included fluency trackers to record words per minute read each week. 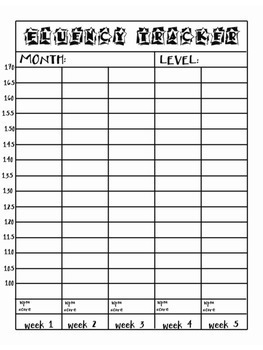 There are various levels and also a blank one in case a child reads above or below the rates given. 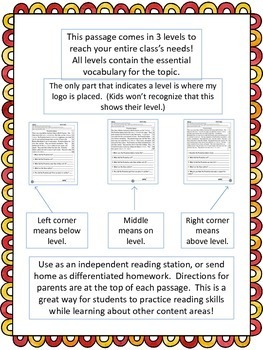 This can be used as homework or as a differentiated reading center. Directions are at the top of each page. The first night students read the passage and circle words they aren't familiar with. The second night they reread the passage and answer the 5 comprehension questions. The third night they have someone time them for 1 minute and write at the bottom how many words per minute they can read. These are designed so that all students can be reading about the topic at hand on their level. Vocabulary they will need to know for each science and social studies unit these correlate to are incorporated into the passage. If you like this you may consider saving money and purchasing the entire science bundle! I also have many social studies passages, and coming soon my social studies bundle, and math passages. Thank you for purchasing from Second Goodies! Don't forget to follow me for more products and updates!